Corner showers are one of the most common shower configurations used in modern homes today. The two glass walls allow for plenty of natural light, and make the bathroom look more open and airy as well. Corner shower doors work especially well in the historic homes abundant in the metropolitan Washington, DC area, from Fairfax County to Silver Spring. Corner shower doors are a bathroom trend that is here to stay! What is a Corner Shower Door? 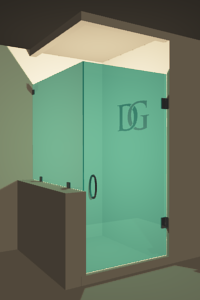 - A corner shower door has two glass sides that connect and two sides that are solid, usually tiled areas. Sometimes one side of a corner shower will have what is known as a knee- or half-wall, where the bottom half will be a tiled wall. These shorter walls are used because of architectural elements of the bathroom, like the shower being next to a toilet or vanity. When you’re choosing your shower door configuration to get a quote, look out for which way the door opens (left or right) and whether you need those knee- or half-walls on your corner shower door. Doors can open to the left or right, and the hinges can be attached to the wall,or to another pane of glass, depending on how your shower is set up. For the Corner 90° shower, you can have two full walls and two glass walls for the shower enclosure or two full walls, one glass wall and one half wall. These configurations are shown below and when you go through our easy online quote process. One thing to keep in mind when choosing a corner shower door is the configuration and measurements. The swinging part of a corner shower door will usually be between 22” and 36” (based on local building codes). If the side of the glass shower with the door on it needs to be wider than 36”, then you will need to add another glass panel to make up the difference. 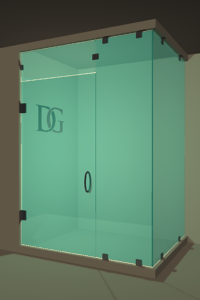 You’ll see this extra glass panel on some of the different configurations available to you when you are getting a quote on the price of your new shower door. Is a Corner Shower Door Right for My Small Bathroom? 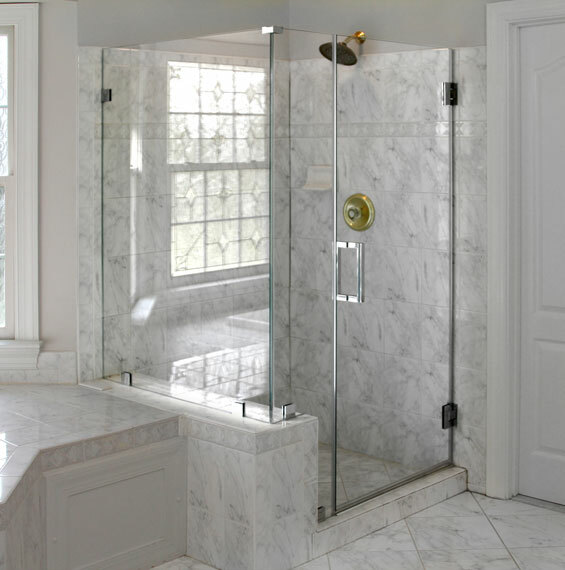 If you have an existing corner shower door, such as one with an outdated brass frame around it, then you’ll probably want to replace your shower enclosure with one of the same shape -- but with a much more updated look! If you are remodeling a small bathroom that doesn’t currently have a separate shower (think an old bathroom with just a claw-foot tub), then you might have some leeway in the shape you choose. A corner shower can be tucked away and use the room’s existing walls. 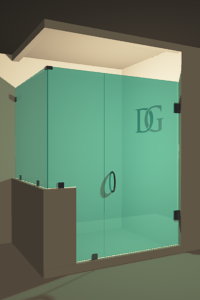 Sleek, modern corner shower enclosures are perfect for your new home. Talk to your builder or contractor -- tell them you want an upgrade from the standard, builder-grade shower that’s sure to disappoint you in short order. Or, if you’re remodeling a home that was built within the last 30 years or so, you’re sure to encounter those lovely framed shower doors -- you know, the kind with the sticking doors and crusty metal rims. Ditch your old shower for a brand-new, easy upgrade for your new home purchase. 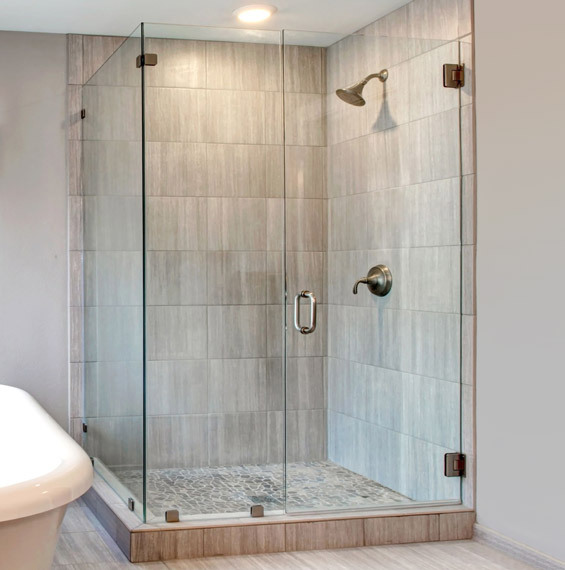 A new frameless corner shower is the perfect addition for your modern home, from Northern Virginia to Silver Spring, Maryland. Uneven Walls: All -- that’s right, ALL -- older homes will have settled over time, resulting in uneven floors. Some older homes will be worse than others when it comes to uneven walls, floors, or ceilings. Angles will not be perfect right angles, and ceilings may be lower than usual and crooked. With proper measurements, your new corner shower door will be constructed to fit your space! Sloped Ceilings: Your small or uniquely-shaped bathroom may have a sloped ceiling where you’re attempting to tuck your shower into a nook or cranny where a standard one won’t fit. That’s where mass-produced shower doors simply aren’t going to cut it. 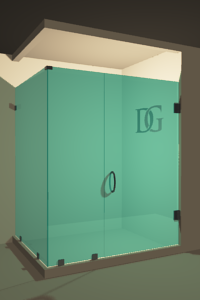 Your shower glass panels will be custom-cut, paired with beautiful hardware, and installed with care. 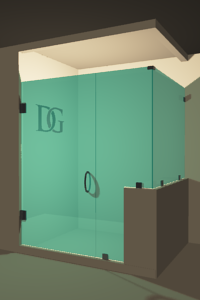 Like all of our shower enclosures, your new corner shower enclosure will be installed with great care. Our installation technicians are trained for years, and most shower doors can be installed in one day. Your shower installation crew will arrive on time and work quickly. Want to know more? Visit our Installation Services section to learn more. Our customer recently shared the transformation of their old, out-dated framed corner shower door into a brand-new frameless shower door. We love to see what our customers have to say after their frameless shower enclosure is installed!